How Efficient is Human Power? One of the early means of transport was the bicycle. It is usually referred to as a human-powered vehicle, because it doesn’t make use of any other source of energy, except human power. People forget how useful bicycles have been in transportation. When you ride a bike, it is far easier than walking. There is no rocket science behind how a simple bicycle operates; it is powered by human effort. The human body plays a significant role in propelling a bicycle. By using the muscles in the body, you can efficiently ride a bicycle from one point to another. The body needs food to build energy in the muscles. 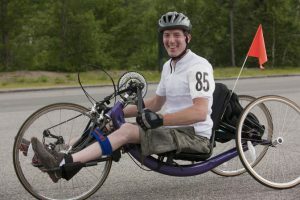 The amount of measurable energy used by the body to operate a regular bicycle, or a recumbent bicycle, does not compare to what you would use when walking. When you compare the calories burned while cycling, to the amount you burn while driving a car, the difference will surprise you. It actually takes just a hundred calories to ride three miles on a bicycle, while that number of calories will only move your car up to 0.05 miles. All over the world, you will find a lot of people still ride their bicycles. There are even cycling groups that meet up on a regular basis, cycling their way around the town. Others see it as a quick way to get to work so they can skip traffic. There are more and more events that come up involving cyclists. This human-powered vehicle has gained a lot of importance over the years and will continue to evolve. Another significant thing about bicycles is that they do not run on fossil fuels but use human power. The power is derived from eating food, and the type of food that is consumed will determine how much power a cyclist can produce. For better performance, it is expected that the cyclist eats food rich in proteins, fats, carbohydrate, vitamins and minerals. A cyclist is expected to drink a lot of water, to avoid problems like heat stroke. You will notice that during cycling competitions, cyclists stop to drink a lot of liquid, either water or energy drinks, to keep up the pace. The muscles are responsible for working the bicycle. A cyclist uses both the shinbone and the thigh bone, to do most of the work. A cyclist’s legs provide the power for cycling. Muscle attached to the thighbone (femur) and the shinbone (tibia) do the majority of the work. These muscles function as a lever to produce more force, as the cyclist turns the pedals. With just a little effort, the bicycle is able to take you to any place you have to go. At the same time, the rider keeps fit while riding the bike.